When we think about the a new year, new beginnings, and new opportunities, it is easy to allow our thoughts to focus on the outcomes we want. For instance, we may want to be debt free, have a new house, get a promotion, or any of a thousand worthy goals. The challenge with this type of thinking is that it puts our focus in the wrong place. None of us can choose our outcomes. We can only choose our disciplines. Our disciplines will choose our outcomes for us. We cannot choose to be debt free. We can choose to use a cash system so that we are forced to spend only what we make and we can choose to begin a debt snowball. We cannot choose to get a raise, but we can choose to develop our leadership skills and influence skills through education and training so that we distinguish ourselves from our peers. In the last few weeks of the year, focus on the disciplines that you will adopt instead of the outcomes you desire to achieve. This idea was the focus of it’s own post called, “The Myth of the Big Change,” which I encourage you to read. The gist is this: Most of us enter the new year with very ambitious goals. We’re going to “fix” everything. We’re going to start an aggressive workout routine and read through the Bible in a year and spend an hour a day on that business plan we’ve been putting off, and we’re going to spend 30 minutes in prayer every day, and we’re going to eat only organic with six small meals per day instead of three, and on and on. Three days into the year, we feel like failures and we abandon the whole lot. Instead of thinking you need to make monumental changes, pick a couple of areas that are aligned with your values and decide to become 1% better in that area this week. At the end of the week, decide whether or not you want to do it again. Read the previous post for more information, but you are sure to have much more significant results if you follow this approach. Some of us just get so overwhelmed or have such a bad history with “New Year’s Resolutions,” that we say, “The heck with it.” Your life is too precious to not get the most out of it, and as you’ve heard me say a thousand times, “Hope is not a strategy!” You can’t repeat the thought patterns, disciplines, and activities of 2011 and expect to get a different result. Focus on incremental improvement. Focus on what is most important to you. 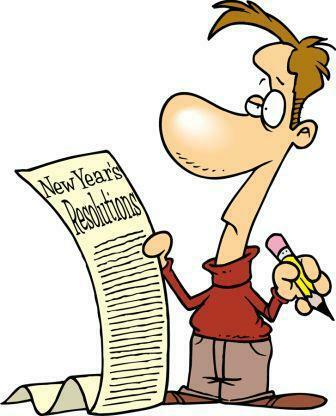 Have a year that will exceed every one of your expectations. One place to start would be to learn the 21 Laws of Leadership. You can do that by downloading the recording of my recent mastermind session here. It’s worth it. You’re worth it! And you CAN do it! I’m here to help. Leave questions or comments in the comments section below. In case you missed them here’s Part 1 and Part 2.